We deal with some pretty brutal winters in the Windy City, so when it finally gets warm enough to do something outdoors, we like to go all out. Nothing pairs better with warm weather in this city than eating and drinking at a Chicago rooftop bar or patio. 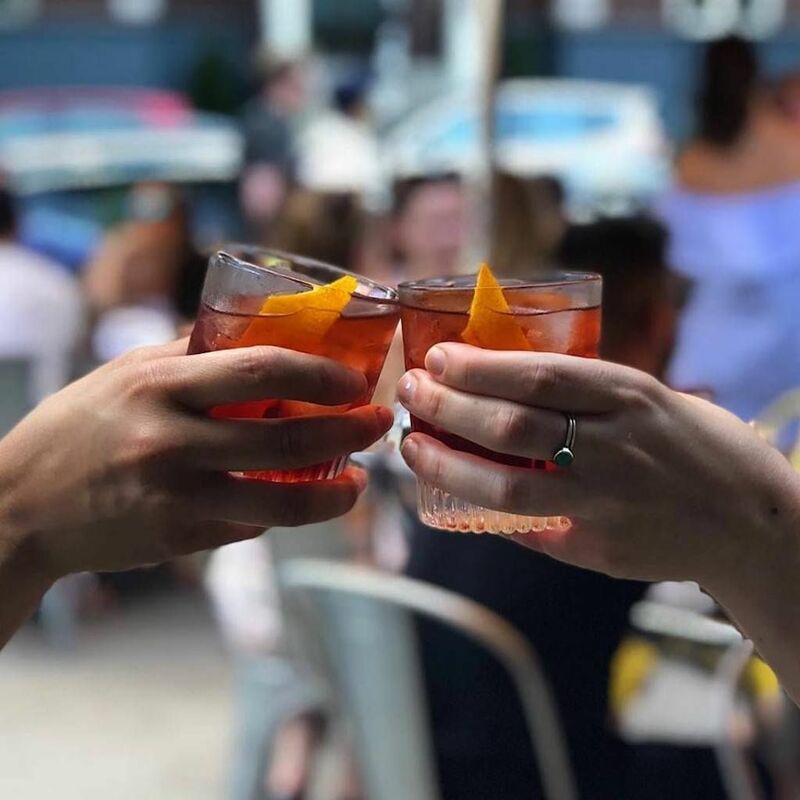 Here are our top outdoor food and drink places in the Chi, including swanky downtown spots, beach-drinking bars, and locals-only neighborhood joints. Even though it’s fairly new, Millennium Park is already one of Chicago’s most iconic spots. It’s a cool enough place that even us jaded locals are (secretly) happy to make it down there once in a while. But boy is it touristy. 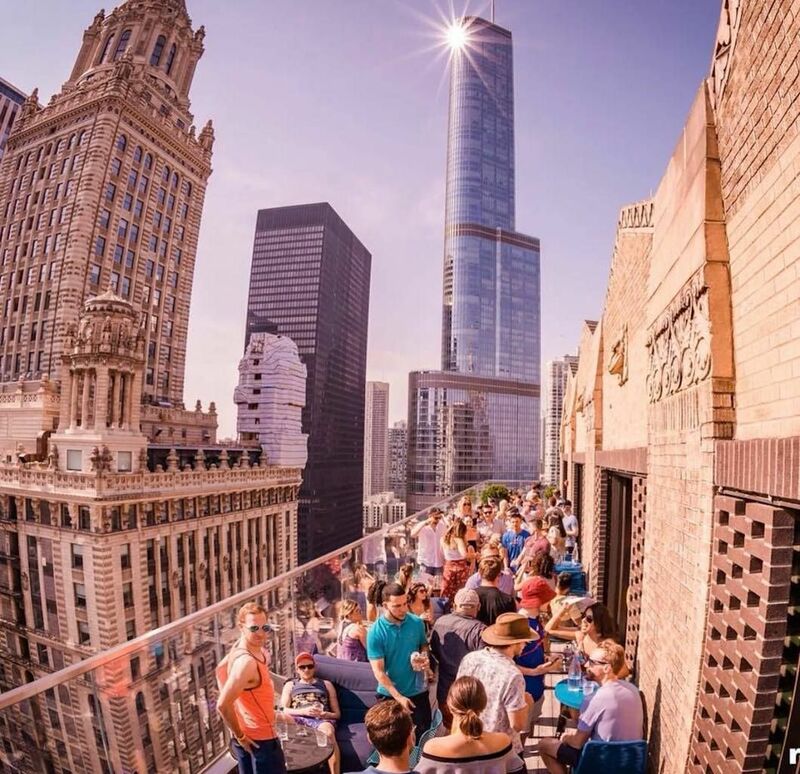 After you’ve worked up a thirst taking pictures of “The Bean,” head across the street to Cindy’s Rooftop, the place with Chicago’s best rooftop bar views. 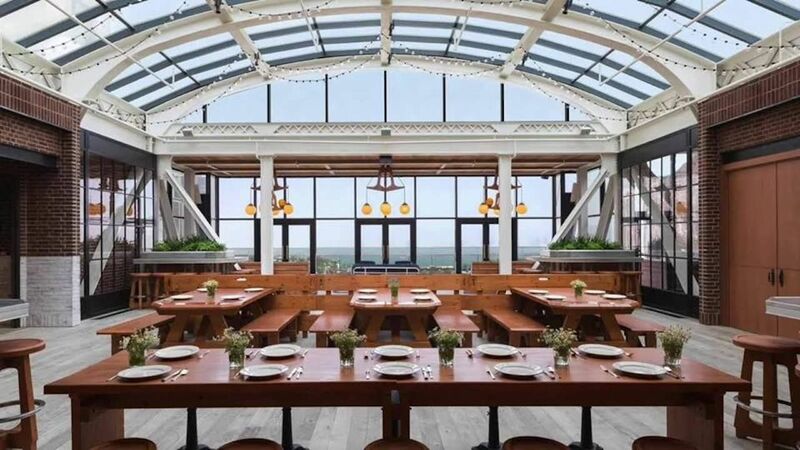 Cindy’s is located on the roof of the Chicago Athletic Association Hotel right across Michigan Avenue from the park. The food at Cindy’s is good, and they serve it up in Chicago-sized portions, so be sure to share. The rotating cocktail list always has some innovative creations, and the beer taps are reserved for local drafts. Cindy’s isn’t cheap, but the views out over the park, “The Bean,” the Frank Gehry-designed bandshell, and the lake definitely get you your money’s worth. Seeing the way local people interact and go about their days is one of the best ways to get to know a new city, and when you can do that with a drink in your hand, all the better. Big Star in Chicago’s hip Wicker Park neighborhood is one of the best spots around to do that. This taco and whiskey joint is crazy popular with locals, and its huge patio along Damen Avenue is full pretty much any day the weather is even remotely good. The creative tacos and other Mexican dishes here are excellent, and the whiskey and mezcal-based cocktails are made to be enjoyed on a warm day on the patio. Big Star also does a great Michelada — a cold can of Tecate beer with a salted rim, lime wedge, and spicy hot sauce added to it. To do it the proper Chicago way, be sure to order a cheap shot of bourbon on your first round. People not from Chicago are usually shocked that we actually have beaches here. It’s understandable considering we’re in the heart of the Midwest, but it’s true. Eating and drinking at the beach in the summer is about as Chicago as it gets, and there’s no better spot to do it at than The Dock at Montrose Beach. The Dock is far enough from downtown that it’s a mostly-locals kind of place, and that means it has some really great prices. 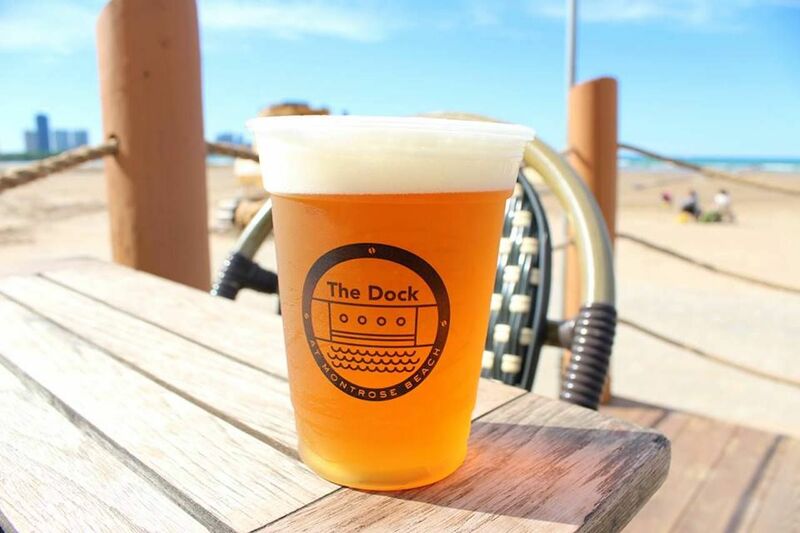 Beers at The Dock start at just $5 and wine and cocktails go from $7. The best part of this Chicago outdoor bar on the beach, though, is the live music every night, all summer long. They have three solid house bands that play regular nights, and a rotating bill of guest bands every other night. Come late afternoon to get in some beach time, then rock out when the tunes start. Open every day until 10:00 PM. Chicagoans know we have the best skyline in the world, and the wide-angle views of it from the surrounding neighborhoods and the Museum Campus are spectacular. But the Chicago River cutting through it all creates an opening that lets you experience it from the inside. There’s one Chicago rooftop bar that gets you this view, and some tasty food and drinks to go along with it. Raised is a hotspot on the third floor of the Renaissance Chicago Downtown Hotel right along the river, with amazing views of the city’s iconic drawbridges and its buildings, both old and new. Raised has a great menu that’s made to be shared. The cocktails are all good and can even be shared when ordered in a six-serving decanter. After strolling along the Riverwalk, this is the perfect place to stop and refortify. If you really want to get away from downtown and get out into the neighborhoods, you need to get yourself to Parson’s Chicken and Fish. 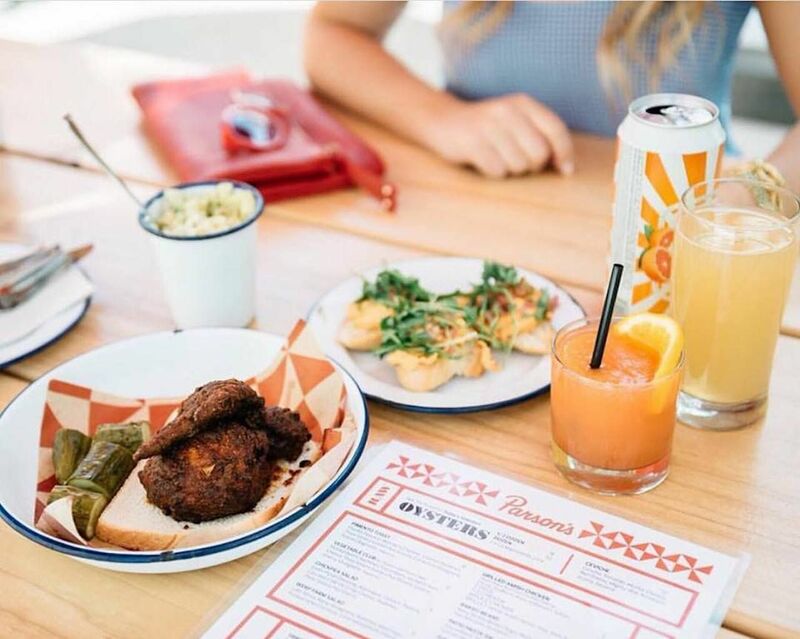 Located west of Wicker Park and between the hot new neighborhoods of Logan Square and Humboldt Park, Parson’s is the spot for hipsters looking for an outdoor bar in Chicago with great food and drinks. Back behind a few converted shipping containers, a huge patio with simple picnic tables is full on any summer day. As the name suggests, this place is about fried chicken and fried fish, plus some simple sides that pair well with both. There are some really innovative cocktails here, plus a solid menu of craft beers with plenty of local options. The real star of Parson’s, though, is the Negroni Slushy — basically a big batch of well-made Negroni cocktail added to a slushy machine and poured to order. It’s insanely good and unbelievably addictive. As a neighborhood joint, there are some good budget options too like a daily cheap beer for just $3. Cerise is a hot new downtown rooftop bar in Chicago serving up great food, drinks, and views. The menu and drink lists take inspiration from Japan with Izakaya-inspired small bites, sashimi, and a good sake list. Cerise is on the rooftop of the 26-story Chicago Virgin Hotel. You’ll want to dress to impress here, which contrary to what some people think, we Chicagoans do like doing from time to time. Be sure to head down a floor from the rooftop and enter through the door with a painted lock to get into the “secret” bar. Every night, DJs spin tunes in there as the fashionable crowd gets down to the Chi Town sounds.